Poi saag is a favourite in most Bengali homes. Lip-smacking dishes and snacks are prepared with this leafy vegetable. Mong toi in Vietnam, shaan choi in China and remayong in Malayasia, Malabar spinach quickly creeps along garden hedges or in pots and so is also called vine spinach. Its Basella alba variety has green stems and Basella rubra variety has red stems, making it a beautiful edible landscaping vine. 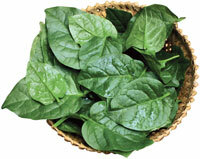 Malabar spinach is cooked in summers as a substitute for spinach, a winter crop. Indians love its pakoras, or fritters, during rainy season when eating spinach is considered a taboo. Spinach grows in the ground and gets contaminated in waterlogged farms. Humidity causes bacterial and fungal contamination in them. But Malabar spinach is safe for consumption during monsoons as its vines are spared of the waterlogged conditions. Cleaning its leaves is, therefore, easy. Its mature stems are used to thicken soups and gravies. But if not combined well with appropriate seasoning, it can impart a soapy flavour. Garlic and asafoetida pair well with this leafy green. Its fleshy leaves become sticky when chopped. This is caused by the presence of mucilage, a non-starchy carbohydrate which heals intestinal wounds and facilitates digestion and easy bowel movement. spinach, it is the mucilage that helps flush out excess cholesterol. Ayurveda practitioners prescribe its leaves to those suffering from ulcerative colitis and bleeding piles. This apart, Malabar spinach is rich in Vitamins A, C and B complex and minerals such as potassium, manganese, calcium, potassium and copper. It is also rich in antioxidants, nourishes the skeletal system and improves the haemoglobin count. A mushy subzi made with poi saag and yellow pumpkin is a popular Bengali way of eating it. Sometimes, the fleshy stems are also added to it. The subzi is cooked in mustard oil with a tempering of fenugreek seeds, dry red chillies, lots of garlic and some ginger. Cubed pieces of yellow pumpkin are added along with salt, turmeric powder and chopped poi saag. It is covered and allowed to cook in low heat in its own juices. The subzi is mashed a little after adding lime juice (optional) and served as a side dish with daal and rice. 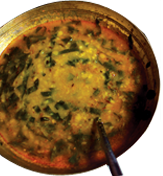 In the Uttar Pradesh and Bihar homes, a daal recipe with Malabar spinach is a staple during summers and tastes great with boiled rice and stir fried vegetables. Yogurt helps metabolise the minerals and vitamins found in the poi saag better. Pressure cook toor daal with salt and turmeric powder. Rinse Malabar spinach leaves and chop them roughly. Finely chop peeled garlic pods. Heat ghee in a pan, tip in cumin seeds and let them splutter. Add broken dry red chillies and immediately tip in the chopped garlic as well. Let garlic turn pinkish brown, and add hing. Add chopped Malabar spinach, salt and stir fry till the leaves wilt and soften. Add cooked toor daal to this and simmer for two minutes before serving.